Born to a small-town California ranching family, the youngest of eight, Vernon “Lefty” Gomez rode his powerful arm and jocular personality right across America to the dugout of the New York Yankees. Lefty baffled hitters with his blazing fastball, establishing himself as the team’s ace. He vacationed with Babe Ruth, served as Joe DiMaggio’s confidant, and consoled Lou Gehrig the day the “Iron Horse” removed himself from the lineup. He started and won the first-ever All-Star Game, was the first pitcher to make the cover of Time magazine, and barnstormed Japan as part of Major League Baseball’s grand ambassadorial tour in 1934. Away from the diamond, Lefty played the big-city bon vivant, marrying Broadway star June O’Dea and hobnobbing with a who’s who of celebrities, including George Gershwin, Jack Dempsey, Ernest Hemingway, Marilyn Monroe, George M. Cohan, and James Michener. He even scored a private audience with the pope. Vernona Gomez is the daughter of June O'Dea and Vernon "Lefty" Gomez. As a child, she bounced on Babe Ruth's knee, made sand castles on the beach with Joe DiMaggio, and won at cards with the legendary Cy Young. Growing up in a baseball family, Vernona brings an eyewitness account to the adventures chronicled in this book. She is a concert pianist, owner of the Creative Coaching Music Studio in Southport, Connecticut, and has two sons, John and Andrew. Lawrence Goldstone is the author or co-author of thirteen previous books of fiction and nonfiction. One of his novels won a New American Writing Award, another was a "New York Times "notable mystery. His work has been profiled in "The New York Times," "The Toronto Star," Salon, and Slate, among others. He lives in Fairfield, Connecticut, with his wife and daughter. “Baseball fans everywhere will appreciate the book. Here was a man who wagered with Ruth, laughed with Gehrig, and roomed with DiMaggio. He was known as the fire-throwing left-hander of the successful Yankees teams of the 1930s and as the man that made clowning around the diamond famous. 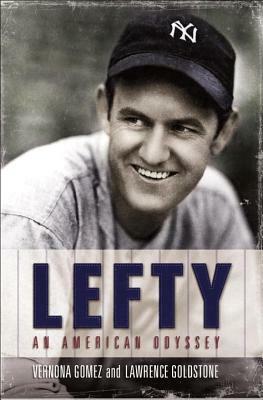 Lefty’s adventurous stories both on and off the diamond will have readers talking about this book for many years to come.”—Steven Tellefsen, president and CEO, Babe Ruth League, Inc.